You can sell our software to your customers and earn a provision. There is no commitment, you can make a one-off purchases. Contact us, we will verify your company and we will send you your individual reseller discount code. Purchasing software for your customers requires agreeing to our reseller terms. As a reseller you are entitled to 20% discount to all our prices. You will receive your individual reseller discount code that you will be able to use to place orders in our online store. I need an invoice issued to my company and license registered to my client, is it possible? Yes, of course. When you order you provide company details for an invoice and license holder separately. Just provide your details in the former and your customer details in the latter. The best way to place an order is to do it in our online store. Enter your individual reseller coupon code (you must have received it from us with an email). To enter code press “Enter Coupon Code” on the first page, enter the code and confirm with “Enter” button. Choose currency – you can do it using the currency picker on the bottom. Choose the right edition and license type and add it to the cart. On the next screen choose the number of licenses. One user requires one license. When this is set, click “Proceed to checkout” button. Your Account – Is your private sales representative account. This is address where invoice and keys will be sent. Billing Address (Reseller) – We will issue invoice to this company details. Please provide your company (reseller) details. License Holder Details (Your Customer) – This is the company we will license our software to and this company name will be embedded in the key (visible in the program. Please provide your customer’s company details. 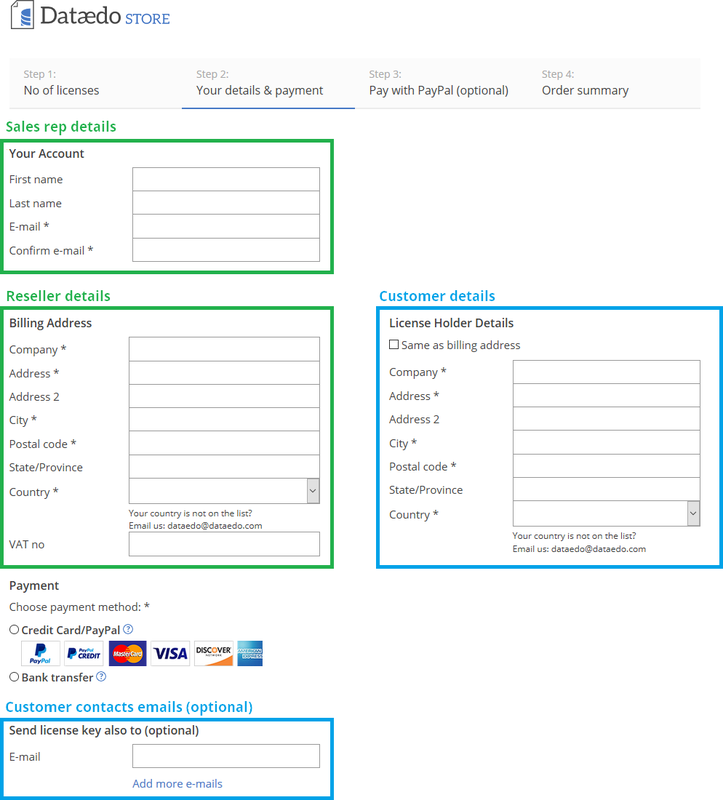 Choose payment option – credit card/PayPal or wire transfer. You are now ready to place an order. If you chose PayPal the you will be redirected to PayPal website to perform a payment. Click “Place order” button. 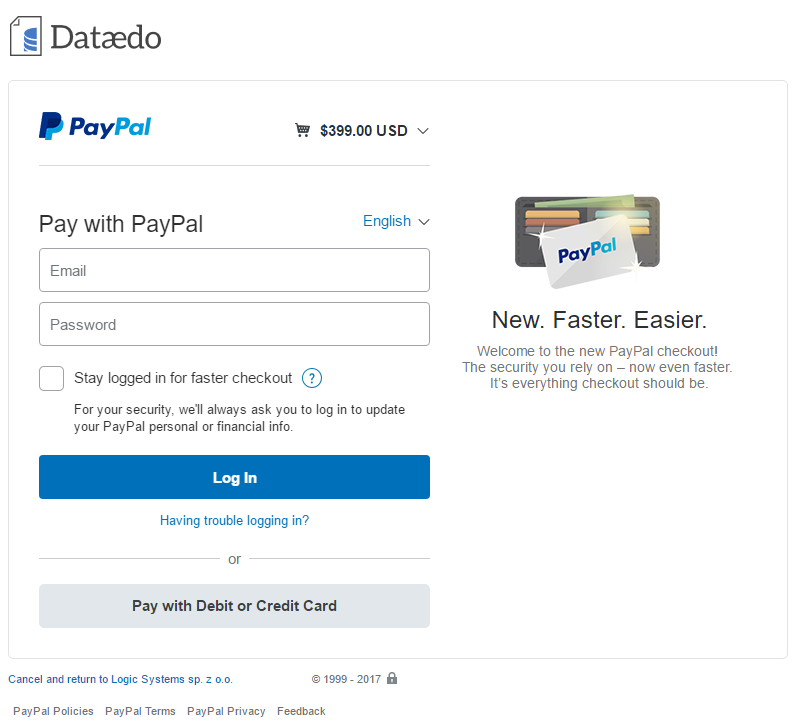 If you chose PayPal you are now redirected to PayPal website. If you have an company account then please log in and make a payment. If you don’t have a PayPal account you can make a payment with debit or credit without logging into PayPal by choosing “Pay with Credit or Debit Card” option. Your order is placed and if/when your payment is confirmed we will send you an invoice and license keys. You can pay with credit card, PayPal or wire transfer. Credit card payments are handled with PayPal but registering is not required. We send you license keys you can enter into our publicly available executable. Your customer can download software on their own, you will just need to deliver a license key. License key is sent to email addresses provided with an order. How long would I have to wait for the delivery? Keys and an invoice are sent immediately in case of successful credit card purchase. In case of wire transfer we send keys and invoice right after we get confirmation from our bank. This usually takes 1-3 days. No, there are no shipping costs. Are there any other related costs? Our prices do not include VAT or other taxes. You have pay all local taxes imposed by the law in your country. When you choose a wire transfer, your bank may charge you their fees. When you choose credit card payment then only the total amount from the order is charged. If I become your reseller is there any commitment? No. You do not commit to make any purchase. You get the right to buy our software at the discounted rate and sell it to your customers.